Chidambaram also played an influential role in re-drafting of the Industrial Policy of 1991 which freed Indian industry and opened up foreign investment. If devaluation of the rupee on July 1, 1991, was the first step to bolster India’s alarmingly low foreign exchange reserves, the dramatic changes in trade policy on July 3-4, set the stage for sweeping changes in the way India engaged with the world. Key to this was then commerce minister in the Narasimha Rao government P Chidambaram and his team, who worked on a new policy to open up trade, boost exports, help foster a more competitive industry. The trade policy unveiled then led to freer imports in a country “weaned on import pessimism”. Chidambaram also played an influential role in re-drafting of the Industrial Policy of 1991 which freed Indian industry and opened up foreign investment. 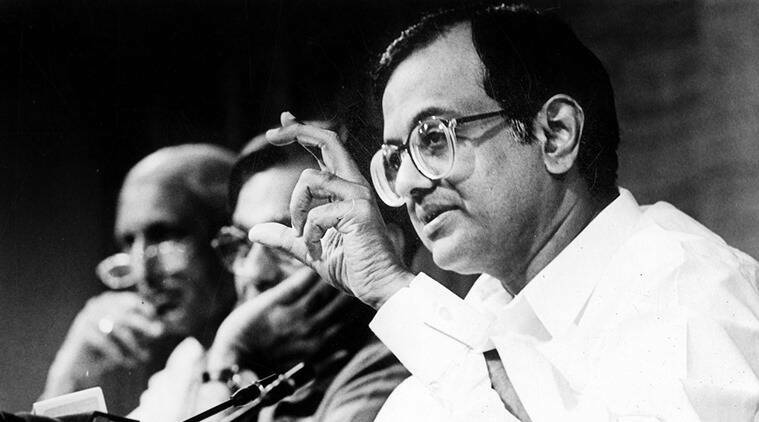 Later, as finance minister in 1997 during the United Front government in what came to be known later as the “dream budget”, he slashed India’s peak tariffs aligning them closer to that of its East Asian peers while lowering maximum personal income tax to 30 per cent and corporate tax to 35 per cent. He also took the first step towards progressively liberalising capital account transactions by replacing a draconian FERA of 1973 with the current FEMA and a money-laundering law besides pushing for financial sector reforms when he returned to the job in 2004 under the Congress-led UPA government. At the end of that government’s term, he helped restore fiscal prudence after a spell of profligacy in the years between 2008-09 and 2013. Going back 25 years ago, when you joined the P V Narasimha Rao government, what were the major challenges? When the government took over on June 21, the major challenge was avoiding a default. There was the danger of a default with reserves barely a billion dollars then. Therefore, the first set of exercises which the finance ministry undertook was how to augment the foreign exchange position; which meant we had to make exports more competitive; and which was why the first major decision of the finance ministry was devaluation. And simultaneously, on July 3-July 4, we announced the first instalment of changes in the trade policy. That was the immediate challenge, though of course I was not directly involved in handling the challenge from the finance ministry side. But I recognised the need to supplement or complement it by taking action on the trade policy side and we announced a package on July 3. 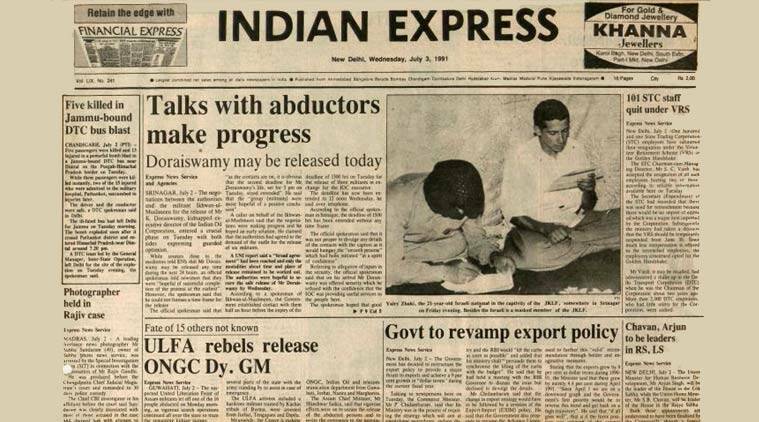 The front page of the Indian Express on July 3, 1991 on the Export policy. Wasn’t there a discussion with the finance ministry on trade policy? Yes. There was. Because Dr Manmohan Singh wanted to abolish the Cash Compensatory Support (an export subsidy) immediately on July 3 evening. And I told him that no commerce minister can start his innings by announcing abolition of a subsidy. So I said it has to be packaged as part of an overall trade package even if it is not a complete package. There has to be the contours of a package and we must announce some measures and then, as part of those measures, one of the measures can be abolishing the Cash Compensatory Support — a point which he immediately accepted as valid. That’s why we worked furiously on the afternoon and evening of July 3. He wanted to announce it on July 3 evening. That is why we announced it on July 3 night. What was Prime Minister Rao’s approach to these changes? All of us went to PM Narasimha Rao, Dr Manmohan Singh, myself, Montek (Singh Ahluwalia). After we had prepared the package, we showed it to him. Manmohan Singhji approved it. Narasimha Rao was a pragmatic man. He turned to me and asked, ‘Have you signed?’ I said, ‘Yes’. He then turned to the finance minister and asked, ‘Have you signed?’ and he said, ‘Yes’. So he took the file and signed it. Of course, for five minutes before that we explained to him what we were doing. He wasn’t too concerned about the details as long as both of us were in agreement. 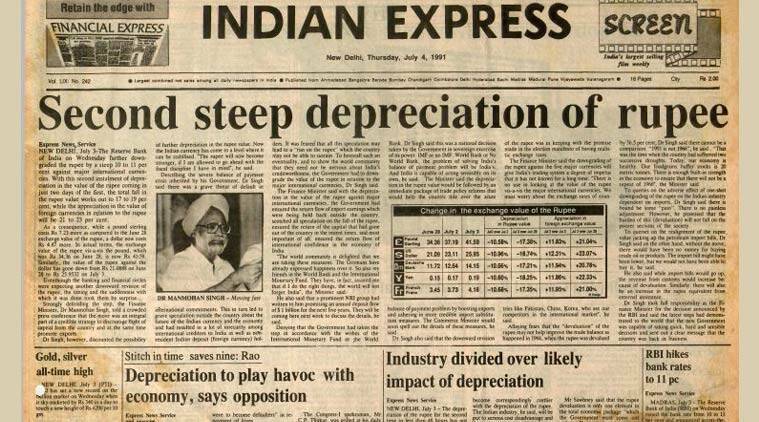 The front page of the Indian Express on July 4, 1991 on the Economic Reforms. Weren’t the changes which were announced in the trade policy already in the works and ready to be implemented before the Rao government took over? Yes. Position papers had been prepared. There were the Alexander committee report and the Abid Hussain committee report. And the commerce ministry had prepared some steps which needed to be taken. But the Chandra Shekhar government had not implemented them as it was a lame duck government. I can’t say whether that government was ready but there was no discussion at the political level. The ideas were there. But when the policy was announced, Chandra Shekharji was furious. He was sitting in the Opposition and he said that this is all a sellout.Then I went to him and said that all this was formulated when you were Prime Minister except that you didn’t get to discuss this perhaps at the political level. I showed him the file. All this is there and there was an exchange between the commerce ministry and the PMO. May be, he was right. Because it was never discussed at the political level. Because at the political level, his preoccupation was survival. He was not at that stage concerned with the trade policy. He came and he left in four months. His main concern was survival. He had 40-odd members and was surviving on Congress support. What were the political challenges and support you received then? The political aspects were being handled by the Prime Minister. Fortunately, the Congress manifesto which was drafted when Rajiv Gandhi was alive — while the exact language was not used — had anticipated and laid out a broad path of liberalisation. And there was opposition from those who were from Indira Gandhi’s time. It was most vocally expressed when we brought the industrial policy resolution to the Cabinet. It was not passed in the first meeting and we had to take it back and rewrite it. But I don’t think many people understood the trade policy. All that they understood instinctively was that imports were being made freer. This was a country which was weaned on import pessimism. And, therefore, reducing tariffs and making imports licence-free was anathema to the socialist group. But I can’t recall any major opposition to the trade policy. There was open opposition to the devaluation and more vocal opposition to the industrial policy. But I think Narasimha Rao handled it well and overcame this. And Dr Manmohan Singh cited the manifesto — as the source of all these reforms! What are your recollections of the Bombay Club of industrialists and how was it overcome? They were fiercely opposed to de-licensing. I don’t think they were opposed to liberalisation of trade. They wanted licences, as they were all protected by these licences. We engaged with the chambers — FICCI, CII. FICCI was the largest and CII was the most active. Fortunately, the CII quickly embraced liberalisation. FICCI was a bit laggard on that. Of the three chambers, it was CII which worked closely with the government on pushing the frontiers of what we can do, on pushing the envelope. Mr Rahul Bajaj was the leader of the opposition to reforms. On the other side, after a few years, Mr Narayana Murthy emerged as a champion of liberalisation. Aditya Birla emerged as a champion of liberalisation. Sadly, he didn’t live too long. Dhirubhai Ambani was also a champion of liberalisation although he had flourished under a licence raj. Twenty-five years after we opened up, what in your reckoning is still closed and needs to be opened up? Of course, I am not satisfied. How can you be? We were a minority government. In the last 30 years, the Congress has not been in a government with an absolute majority. So every time we had to do reforms, we had to look behind our back. We had to watch our backs. If we had 282 as the BJP has got today, we would have done much more. If you were in a similar role as commerce minister or finance minister now, what would you have done? That’s not a fair question at all. We are not here to give free advice to the government. We can only react to their policies. You cannot offer an alternative policy, a fleshed-out alternative policy, unless you have all the information, and the full information is only available with the government. You can hint at broad approaches. For instance on GST, our approach is clear. There must be some restraint — some cap — on the taxing power of the central and state governments under the GST law. Now the government doesn’t seem to agree. But if we were in government, we will know how to bring such a law and make it acceptable. What should be done in terms of reforms over the next 25 years? There are a lot of outdated structures which have to be dismantled. We are still not a fully open and competitive economy. There is still too much government intervention or interference in economic activity. We have a very outdated concept of what the public sector is. We cannot distinguish between ownership and management. In this country, the owner is himself the manager. And even if he gives up financial ownership, he wants to retain some other kind of political or moral ownership. Take, for example, universities. Many universities are today financially autonomous. IIMs and IITs could be financially autonomous. But look at the way the HRD ministry wants to control them, exercise political ownership of the IIMs. In fact there is more control over the IITs and IIMs today than there was two years ago. So we need to distinguish between ownership and management. How does France run its public sector? They own it but they don’t manage it. Economic reforms 25 years later, what does it signify to you now? It signifies that we have freed ourselves of any ideological barriers. We have removed the ideological barriers which we had built around us. We are willing to look at any idea on its own merits. Not through an ideological prism. We are also willing to trust the private sector more to provide goods and services. For example, even in the area of defence. We are also prepared to accept that there will be foreign investment in any developing country and one doesn’t need to fear foreign investment. All these are major strides since 1991. What do you make of the reforms over the last couple of years? What are they talking about? I can hear rhetoric. I can see acronyms. Yesterday, for example, another acronym was floated — RAPID. Who remembers last week’s acronym? Who remembers last month’s acronym? I need to see a substantial policy paper on any subject. And then I will comment on whether these are reforms or not. What happened to the Financial Sector Legislative Reforms Commission report? What happened to the Direct Taxes Code? These are serious questions which have to be answered. Two years is a long time for a government. You can no longer call yourself a new government. It is like saying that I am newly married but I was married four or five years ago. You are not newly married. Two years is 40 per cent of your term. What were the challenges of carrying out reforms in a coalition government, your famous ‘dream budget’ being an example? What are the political challenges to reforms in India now? What is the way forward in our political economy? Reforms have a political, social and economic context. Even for doing economic reforms, the government must prepare the country for political and social reforms. Unfortunately, instead of advancing, we seem to be regressing. Instead of expanding freedoms, we seem to be restricting freedoms. The right wing of the BJP, the right wing organisations and the RSS are making an effort to throw us back to the past. They will not succeed, but they could succeed in dividing the country. If these trends are not reversed, the absolute majority that the people gave to the BJP and to Narendra Modi will be a wasted benefaction. You have spoken on the fine balance between management and ownership. How do you see the balance between operational autonomy and government accountability, objectives… considering the conflict during your time, too, between RBI governors and you? The government has failed the people in the appointments it has made in recent times to key institutions. Some of them are so terrible, one feels ashamed. The nation was appalled by the manner in which the government handled the issue of a second term for Dr (Raghuram) Rajan. Our government had a respectful, mature relationship with RBI governors. Of course, on occasion, we differed, but no one in our government or party abused an RBI governor. All governors appointed by us completed a five-year term, retired gracefully, and were entrusted with important responsibilities afterwards — eg, Dr Rangarajan, Dr Jalan, Dr Reddy. The importance of institutions to a nation’s progress is well acknowledged. How do you see the evolution of that over the last 25 years and how do you see it now and ahead? We have travelled on a road that had many ups and downs. I am afraid it will not be too different in the future, too. Nevertheless, we did not do any damage to institutions. I am no longer sanguine about the future. We have to be very watchful, lest institutions are permanently damaged.